This listing is for 10 pcs. 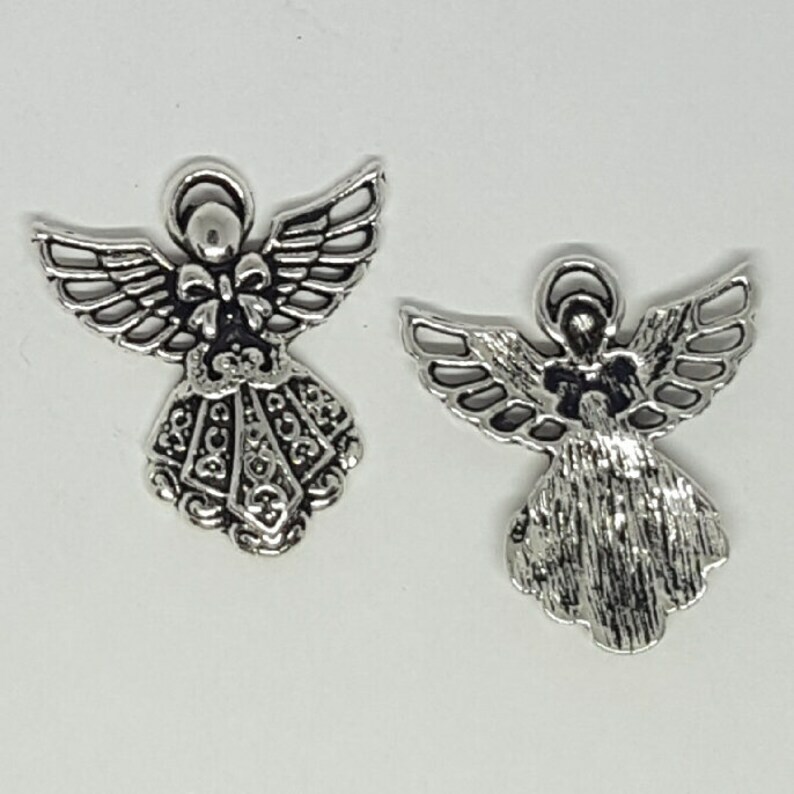 silver angel charm/pendant. This silver angel pendant makes a great necklace to give a loved one as a gift! They also make adorable key chains, also beautiful bookmarks too! Tibetan style pendant, Nickel free, lead free, cadmium free. Great timing. It was easy to add charms to the links in the bracelet. My only problem was spacing the charms as I added them to bracelet. This was a new learning experience for me. The charm bracelet arrived on time for my project. It was easy to attach my handmade charms and drops to the bracelet. I will shop here again. Got my package today and was so please not only with the item but care taken in the packaging. It shows compassion for what you do. Thanks. Payment should be made at the time of purchase from Etsy...simply sign into your Paypal account, if that is the means by which you would like to pay, and make sure to click pay now. If you have any difficulties, please feel free to send me a convo from Etsy or an e-mail to destiny_heaven@msn.com and I will be glad to send you an invoice to pay from. If I do not receive payment at the time of purchase from Etsy....I usually send a notice to you that day to let you know that the transaction isn't complete and I offer to send you an invoice. Please know I will do everything in my power to contact you, but if no payment is made within 7 days, then the item will be relisted and the order will be cancelled. Items are well represented on my website, so read the descriptions carefully and make sure that understand what each item is made of and if you have any questions...please ask before you purchase the item. Please note: Different monitors can display different shades of colors, so I've been as accurate as I can in my descriptions about each items color, so there will be no refunds based on color issues. If an item is damaged by the Post Office, then you can contact them...make sure to take pictures of the packaging before it is opened. If an item is broken in shipping, due to poor package on my part, which has never happened to my knowledge, you can contact me and we will work something out to get the item repaired or replaced...notice...I must be contacted immediately upon receipt of the item if there is any problem. If it is the fault of the U.S. Postal Service then it would be your responsibilty to contact them. No refunds will be issued after 10 days receipt of the item. Items must be returned prior to the 10 day period in order to obtain a refund for the item. Customer is responsible for shipping charges incurred in returning the item to the seller. You are welcome to convo me prior to the purchase of any item if you have any questions. **I ship all of my items First Class Mail usually the day of order or the following business day and it usually takes between 2 to 5 days to arrive. I do used a 6 x 9 bubble wrap envelope for extra protection of your item during shipping. If you want insurance, please let me know at the time of purchase, there will be an additional charge. Insurance is not offered for shipments out of the U.S.A. due to the fact that it would be cost prohibitive. If an order is returned due to incorrect address given by customer, the customer will be responsible for the shipping charges to reship the item. If they customer requests a refund, then I would refund the original purchase price less the shipping charges that were incurred to ship the first time. Crystal has unique properties and recently, there has been an increased regulatory focus on potential human exposure to lead from various consumer products, including jewelry. The crystal manufacturing process creates a matrix which inhibits the mobility of lead. In other words, lead is bound into the structure of the crystal. Because of this structure, lead crystal poses no significant risk of excessive lead exposure to human health via surface contact (hand to mouth), mouthing or even ingestion. Indeed, Swarovski crystals have been tested under a variety of test methods for extractable lead. Test conditions and procedures do vary, but lead levels are well below regulatory limits even when the crystal is tested in an acid solution to maximize the release of lead.